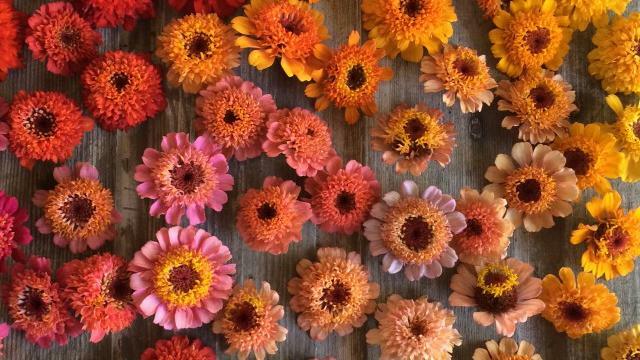 From flower shops to farm fields, check out our top picks of swoon-worthy Instagram flower feeds. Floret Flower Farm (@floretflower)Erin Benzakein, flower farmer & head designerWe know it’s a lot of hard work to grow flowers for a living—but, seriously, Erin Benzakein and the Floret Flower team make it look so utterly romantic, they’ll have you ready to switch careers. Erin plants her entire dahlia field in rainbow order so that each harvest truckload is a different, photo-worthy palette. Studio Choo (@studiochoo or @smallstump)Alethea Harampolis & Jill Rizzo, head florists & founders of Studio Choo, co-authors of The Flower Recipe Book (2013)Masters of creating wild, asymmetrical designs with unusual ingredients, Alethea Harampolis and Jill Rizzo will fill your feed with to-die-for arrangements. Cherry tomatoes spilling out of an urn, anyone? Farmgirl Flowers (@farmgirlflowers)Christina Stemble, head florist & founder of Farmgirl FlowersDelivering American-grown flowers by bicycle to doorsteps throughout San Francisco, Christina Stemble and her team at Farmgirl Flowers bring weekly inspiration from the flower field to the vase. Theewallflower (@theewallflower)Eleanor Gerber-Siff, head florist for Bi-Rite MarketBringing local grocery store flowers to a whole new level, Elenor Gerber-Siff hand-selects each bloom on display at Bi-Rite Market in San Francisco. Check out her Instagram where she highlights the single, most beautiful blossom of the week and you just may find your new favorite. Twigss Floral Studio (@twigssfloral)Addison & Melissa Searles, head florists & founders of Twigss Floral StudioOften combining unusual ingredients—carnivorous pitcher plants in boutonnières!—with classically romantic elements, the work of this mother-daughter design duo offers fresh inspiration for wedding arrangements.